This ecoregion covers the eastern slopes of the Cascades from the crest down to the shrub-steppe margin of the Columbia Plateau at about 2,000 feet elevation. The northern boundary is Sawtooth Ridge (for most of the way, the Chelan-Okanogan county line) and the southern boundary is the Columbia Gorge from Dog Mountain to Rowena Gap. Beyond Washington, the ecoregion stretches across Oregon to the Modoc Plateau of northeastern California. These mountains are formed of a complex mix of old seabed and other sedimentary rocks, granite and more recent volcanic materials, and glacial rubble and silt. They are part of the North Cascades microcontinent, which joined the North American landmass about 50 million years ago. Wenatchee is on the east coast of this former island; farther south, the continental suture lies buried beneath lava flows from the Cascade volcanoes and the Miocene basalts of the Columbia Plateau. The highest of the ecoregion's volcanic peaks, Mount Adams, last erupted as recently as 6,000 years ago. High, southeastward-trending ridges emanating from the Cascade crest alternate with deep, glacier-carved valleys with rivers flowing to the Columbia. The most spectacular of these, dammed by its moraine, is Lake Chelan. The ecoregion has many other lakes and several reservoirs, including long reaches of the Columbia behind Bonneville and Rocky Reach dams. The climate is transitional between the maritime regime of western Washington and the continental regime of the Columbia Plateau. The Cascade crest has moderate temperatures (except for the highest peaks) and is very wet, while the lower edge is dry with warm summers and cold winters. Average annual precipitation measures 100 inches at Snoqualmie Pass and nine inches in Wenatchee. Snowfall is heavy at the crest (about 40 feet annually at Stevens Pass), but Cle Elum, near the ecoregion's lower edge, sees just seven feet annually. Average January low temperature in Cle Elum is 20 degrees F and July high temperature 81 degrees F. Strong, steady winds often blow through the Columbia Gorge, a product of differences in atmospheric pressure east and west of the Cascades. The East Cascades are almost entirely forested. Vegetation is highly diversified in response to the wide spectrum of available moisture. A transition zone at the lower edge has steppe vegetation on dry slopes and fingers of ponderosa pines extending along drainage courses, and is succeeded in the foothills by open ponderosa pine forest with an understory of grasses and shrubs. Black cottonwood occurs along streams, with groves of quaking aspen in damp places. In the southern part of the ecoregion, Garry oak woodlands occupy this transition zone. At somewhat higher elevations, Douglas-fir begins to appear, alongside ponderosa pine, lodgepole pine, and western larch at first, but eventually shading out these species as the forest closes its canopy. Typical plants of the understory here are common snowberry, bitterbrush, and kinnikinnick. Grand fir is the prevalent tree species at middle elevations. Moist mountain meadows are common in forest openings. Damp conditions on the upper Cascade slopes promote growth of a closed-canopy conifer forest dominated by western hemlock and western red cedar with a shrubby understory (huckleberries, Oregon boxwood, western twinflower). Still higher, subalpine fir and Engelmann spruce characterize the forest landscape up to treeline; grasses, sedges, huckleberries, rhododendron, beargrass, lupine, and many other plants form the understory. Bogs, fens, and forested wetlands ("spruce bottoms") are among the wetland types. Dense groves of Sitka alder thrive along seeps and in avalanche chutes. Subalpine parklands and alpine meadows can be found on Mount Adams and several high peaks north of Snoqualmie Pass. Although the ecoregion is lightly inhabited (Wenatchee is the only sizable city), it has been noticeably impacted by resource extraction, especially logging. Clear-cutting has denuded whole square-mile sections in middle-elevation forests, but extensive mid- to upper-elevation tracts are protected in North Cascades National Park, Lake Chelan National Recreation Area, and several wilderness areas. Lower elevations are vulnerable. 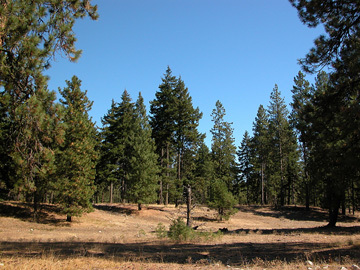 Ponderosa pine forests have been logged selectively, resulting in the removal of a large proportion of mature trees. Fire suppression threatens open woodlands of ponderosa pine and Garry oak by allowing other tree species to mature and outcompete them. Overgrazing in the grassy understory has promoted replacement of native grasses and forbs by exotic invasives such as knapweeds and cheatgrass. The coal mines around Cle Elum have closed, but large-scale resort development there has introduced another form of habitat degradation.